Jockey Florent Geroux celebrates after winning the Falls City Handicap (G2) aboard Prado's Sweet Ride. The feature race on Thanksgiving Day at Churchill Downs is the $200,000 Falls City Handicap (G2) for older fillies and mares going 1 1/8 miles on the main track. 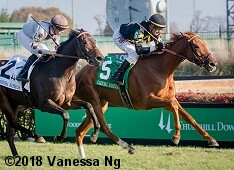 Conditions were typical for late November in Louisville, with clear skies and temperatures in the mid 50's, wtth the main track fast and the Matt Winn Turf Course yielding. Beldame Stakes (G1) runner-up Divine Miss Grey was sent off as the 3-5 favorite in the field of 7 off her win in the Chilukki (G2) on Breeders' Cup Saturday. 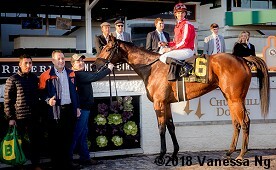 In to challenge her included 11-2 second choice Prado's Sweet Ride, 3rd in the Illini Princess Handicap at Hawthorne, and 6-1 third choice Skeptic, 8th in the Spinster (G1) after winning the Monmouth Oaks (G3). Down the stretch with Prado's Sweet Ride out front. Jockey Florent Geroux sent Prado's Sweet Ride to the lead first time past the Spires and she set fractions of 23.93, 48.60, and 1:13.17 while pressed by 11-1 Mannerly and stalked by Divine Miss Grey. Entering the stretch, Prado's Sweet Ride opened up a 2 length lead through 1 mile in 1:37.79. Kept to task by Geroux, Prado's Sweet Ride drew off late to win by 4 3/4 lengths over Divine Miss Grey in 1:50.50 over the fast main track. It was another length back to 14-1 Dutch Parrot third. Prado's Sweet Ride in the winner's circle. 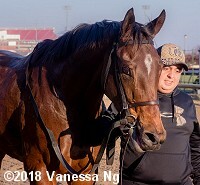 Martin Martinez, assistant to trainer Chris Block said, "This has been a very good Thanksgiving for us thanks to this filly. She ran so big this afternoon and trained so well all season. She really handled the dirt well this afternoon and she has in the past. She's been very versatile and was very impressive today." Right: Prado's Sweet Ride heads back to the barn. Winning jockey Florent Geroux said, "I really didn't expect to be on the lead but I thought we would be close to the pace. Things worked out well. We had a perfect pace up front when (Divine Miss Grey) didn't break that sharply. She dug in well down the lane and was very impressive this afternoon." Left: Second place finisher and beaten favorite Divine Miss Grey in the paddock before the race. The 3-5 favorite stalked the pace 1 1/2 lengths off early under Tyler Gaffalione, but could not improve late finishing 2nd beaten 4 3/4 lengths. 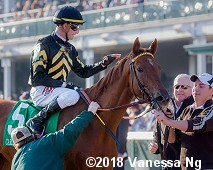 The Danny Gargan trainee improved her record to 11 wins, 6 seconds, and 1 third in 23 starts, earning $846,872 for owners Corms Racing Stable and R.A. Hill Stable. Right: Third place finisher Dutch Parrot heads out for the post parade. The 14-1 shot raced 6th 6 lengths off the pace under Ricardo Santana Jr. then passed tired horses to get third beaten 5 3/4 lengths. 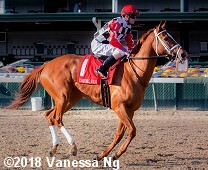 The William Van Meter trainee improved her record to 4 wins, 3 seconds, and 5 thirds in 20 starts, earning $388,607 for owner-breeder Shortleaf Stable Inc. 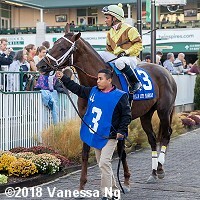 The turf counterpart to the Falls City is the $100,000 Cardinal Handicap (G3), featuring a field of 10 older fillies and mares going 1 1/8 miles over the Matt Winn Turf Course. 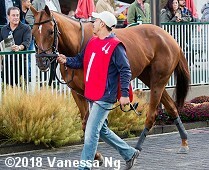 I Remember Mama was sent off as the 3-2 favorite off a Keeneland allowance win after finishing a close second in both the One Dreamer Stakes at Kentucky Downs and the Ellis Park Turf Stakes. 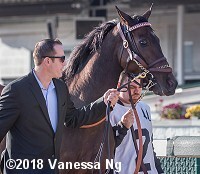 In to challenge her included 3-1 second choice English Affair, 3rd (but moved up to 2nd via DQ) in the Dowager (G3) at Keeneland, and 11-2 third choice Bonnie Arch, 8th in the Ladies Turf Stakes (G3) at Kentucky Downs. 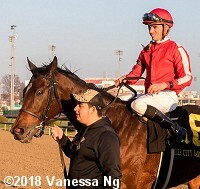 Jockey Jose Betancourt sent 37-1 Unbridled Escape to the lead first time by through fractions of 24.79, 50.62, and 1:16.91 while pressed by 22-1 Coco Channel and stalked by Bonnie Arch and 16-1 Coachwhip. Turning for home the frontrunners tired, as I Remember Mama, 9th early, swept 6 wide to lead through 1 mile in 1:42.28. However, English Affair, 8th early under Corey Lanerie, came out 3 wide after a ground-saving trip and outfinished late-running 7-1 fourth choice Amboseli to win by 1/2 a length in 1:54.26 over the yielding going. 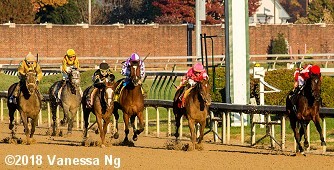 It was another 1 1/4 lengths back to favorite I Remember Mama third. Left: English Affair in the winner's circle. Winning traine Rusty Arnold II said, "She's a typical English Channel that is getting better with age. We've run her going a couple of different distances and it just shows her versatility. Today's race (at 1 1/8 miles) came up and it was the perfect spot to run her in." 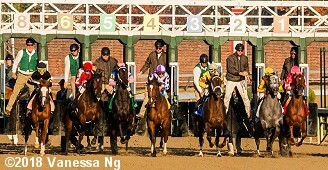 Right: English Affair returns after the race. Winning jockey Corey Lanerie said, "She handled things perfectly today. I was just the passenger. We had a great trip the entire way around the track and when I asked for her best stuff, she dug in and finished really well. I took her back early to settle and waited for a spot to open." Lanerie won 4 of the 12 races on the card. Left: Second place finisher Amboseli walks over before the race. Jockey Florent Geroux said, "We had a really good trip. 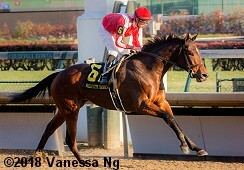 My horse tried really hard down the stretch but just couldn't quite get to the winner." The James Cassidy trainee improved her record to 2 wins, 4 seconds, and 8 thirds in 24 starts, earning $194,557 for owner D P Racing LLC (Deron Pearson). Right: Third place finisher and beaten favorite I Remember Mama in the post parade. The 3-2 choice was 9th early and 7 lengths off the pace under Brian Hernandez Jr., rallied to lead midstretch but yielded to the closers late. The Thomas Drury Jr. trainee improved her record to 3 wins, 3 seconds, and 2 thirds in 8 starts, earning $182,300 for owner-breeder Lewis Schaffel.